Easy to prepare, delicious and absolutely gorgeous aronia berry (chokeberry) smoothie recipe that will keep you satisfied for a long time. Wash the apples, core them, and finally cut them into smaller chunks. Peel the banana and slice it. Wash the aronia berries. Put the fruit and berries into the blender. Add the honey, water and cinnamon, or, alternatively, add them later to the mix. Blend until smooth. Note 1: The aronia berries' skin is tough so small pieces might remain. Add more water to the mix if needed. Note 2: Some people like cooking the aronia first, to improve the taste. I suspect this comes at a price of some of the vitamins and minerals disappearing. If you feel like cooking them first, you can let them simmer in water on a saucepan, covered, for some 10 minutes. Remember to stir often. 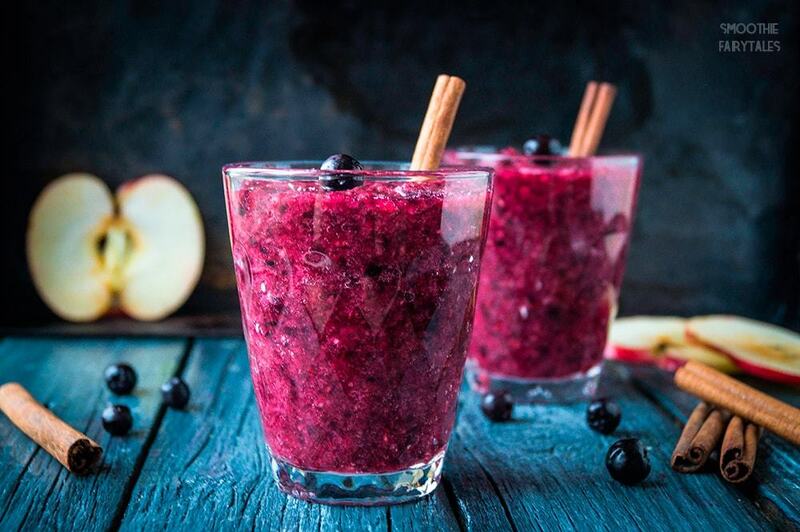 Pour the ready smoothie into glasses, decorate with aronia berries and a stick of cinnamon.